With 2015 upon us and everyone making New Year's Resolutions, I figured I'd give some love to the most popular second language in the U.S., and the official language in over 20 countries around the world: Spanish. To do this, recently I've been busy behind the scenes asking language learners to share their biggest issues with learning Spanish so I can help demystify the process. I received a huge number of requests for help! So I set aside some time to work on helping all of you learn Spanish as fast and easy as possible, and I've created a new guide called Why Spanish is Easy to help you. It includes tips, hacks and resources to help you fast track your Spanish learning, with encouragement for anyone who may have tried to dip their toes in the language, but found it hard to learn for several reasons. I know more than anyone what that's like to struggle with Spanish, considering that Spanish was my first real attempt at learning a foreign language, and I got nowhere with it myself for six entire months before things took off for me. Ultimately I realized that I needed to view the language in a different way, and since I haven't seen anyone else write about that (even now, 12 years later! ), I want to share these ideas myself! But today I'll also give you a free taste of the new guide right here. So let's get to today's blog post which is a segment taken from Why Spanish is Easy guide specifically about how to understand spoken Spanish. One of the first thoughts you’ll likely have when you hear Spanish spoken naturally is Why are they speaking so fast? This was a big problem for me when I first got into Spanish properly. Even if I could read a sentence written out in Spanish and get the gist of it, if someone spoke that same sentence aloud to me, it would be a jumble of noise. What gives? While I wish I had a magic cure for this problem, the truth is that you need to train your ear to associate Spanish sounds with the written form, and this does take time. But it doesn’t have to take a lot of time. With just a few weeks of consistent practice, you can train your ear to adapt to the sounds of Spanish. First you’ll need to get used to the phonetic system and it’s connection to pronunciation. But what do you do to help associate those sounds with actual words? The trick is to ease yourself in through Spanish content that is appropriate to your level. In my case, in Spain, I found Spaniards speaking at normal speed almost impossible to understand. I was close to giving up when I found that making friends from Mexico and Ecuador (even while in Spain) made a world of difference, because Mexicans and Ecuadorians tend to speak Spanish more slowly. Next, I highly suggest you try watching telenovelas (soap operas) from places like Colombia. This helped me a lot, since the stories have very simple plots which keep me engaged, while at the same time I get to listen to genuine spoken Spanish. After a few months using this technique I was ready to talk to Spaniards, and now I understand them just as easily. If possible, try to get your favourite movie or TV series in Spanish. To do this, I generally search for the series on Wikipedia, then click on the left to view the equivalent article in Spanish. There you can find the series’ equivalent name in Spanish, and you can try to get the box set on Amazon. Watching a movie or TV series in Spanish that you already know well in English is excellent practice. You already know the story, and often you’ll remember what the characters are going to say. This means you don’t need to try to figure out what’s going on, and you can focus on the words being said in Spanish. I learned a huge amount of Spanish from watching Los Simpson (The Simpsons) on Spanish TV thanks to enabling subtitles in Spanish (not English!) so that I could learn to associate the written form with the spoken form. If you make friends with native speakers, you should ask for suggestions on their favourite shows and consider watching them originally in Spanish, rather than just watching dubbed versions of American or British shows. This will help you understand more of Spanish culture as well. Listen to Spanish music. You can find many stations in Spanish on tunein.com, or you can Google what songs are in the top 40 charts in your target country. Then find the lyrics (Google the song name with the word “letras” for lyrics) and try to follow along. This blog post by Andrew goes into great detail of how he does this, using Shakira’s Tortura as an example. I find that love songs tend to be sung slower and are easier to follow. progressively harder and the speakers increase the speed at which they speak. I generally try to aim for one level higher than my current one, to push myself. Study Spanish audio at different speeds. You can take audio from a naturally spoken podcast, recording of a radio show, or interview and slow it down using the free tool Audacity. Simply import the audio file once downloaded, and then click Effect > Change Tempo. You can also change video speed in VLC (Playback > Speed) or QuickTime (Window > Show AV Options). You can get audiobooks recorded in Spanish on Audible – their native player on Apple and Android devices allows you to slow down the speed up to 3 times. Yes, Spaniards speak fast, but Spanish can be easy to learn if you think about it in the right way, and if you have the right approach. 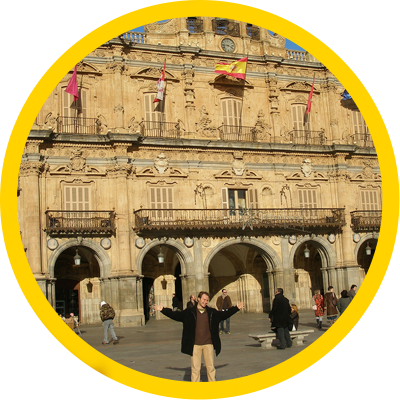 This blog post is an extract from my language hacking guide Why Spanish is Easy. Pick up your own copy here!